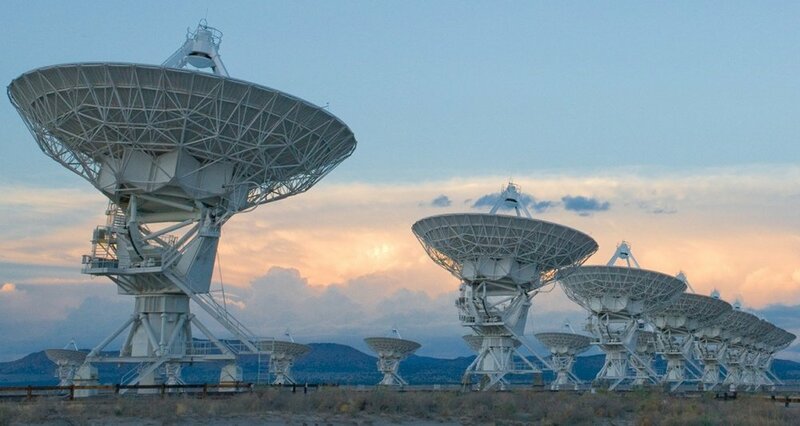 What is radio astronomy? It’s the fascinating science that studies the Universe by detecting radio emission from celestial objects like the Sun, the Milky way, planets, galaxies and nebulas. 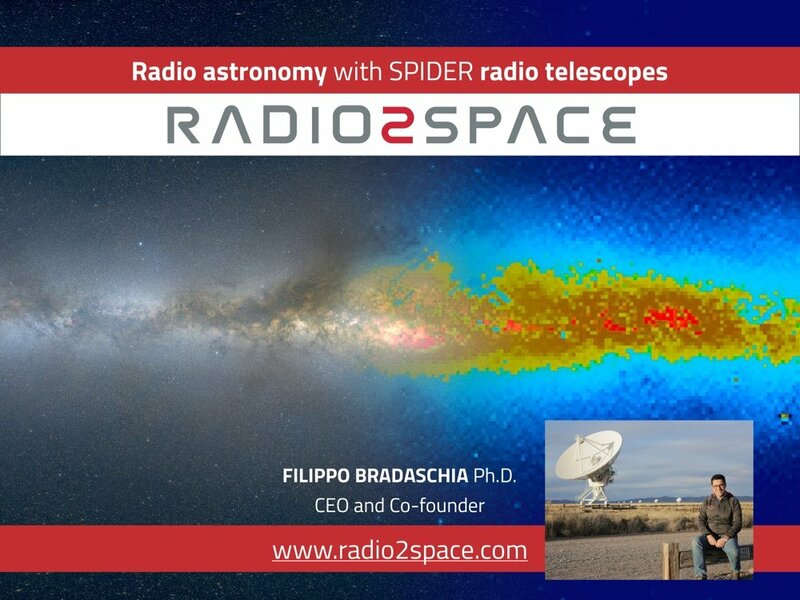 In this presentation Filippo Bradaschia, Radio2Space co-founder, gives an overview on radio astronomy history and basic physics. Then he introduces the most important radio sources in the Universe and the Radio2Space SPIDER radio telescopes that allow any school, university, museum or science institute to make real radio astronomy with powerful but affordable, compact and easy to use radio telescopes. 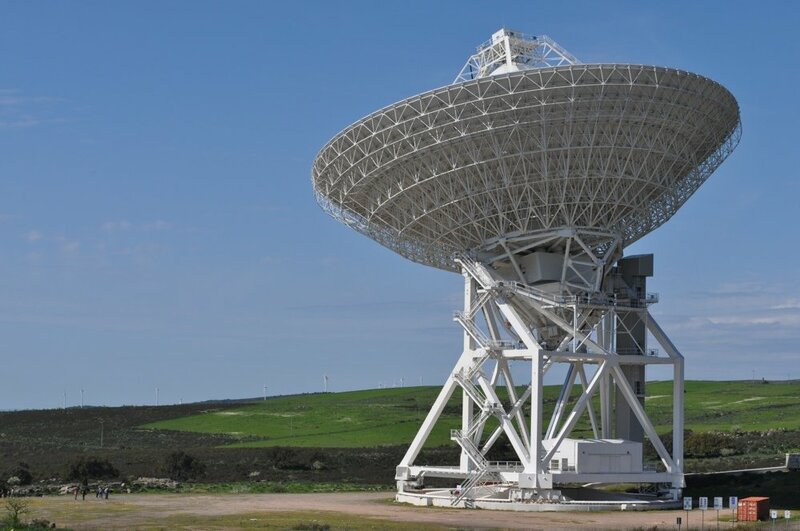 By today, radio astronomy can be performed not only by professional radio astronomers. In fact Radio2Space builds complete radio telescopes ready for use for educational (schools, universities, science museums) and research (science institutes, space agencies) markets at an affordable price. This way you no longer need to study how to build a radio telescope but you can use a certified and powerful instrument, and focus your attention in getting data and make real radio astronomy! SPIDER radio telescopes are turnkey systems composed of the antenna, mount, pier, receiver and software, ready to capture radio waves coming from space. Antenna diameters range from 2.3 to 5 meters with different types of mounts, also weatherproof in order to allow the radio telescope to be installed in the field without the need of a protection structure. Every SPIDER radio telescope is designed to be remotely operated from a control room where the H142-One 1420 MHz receiver with computer and RadioUniversePRO software are installed. 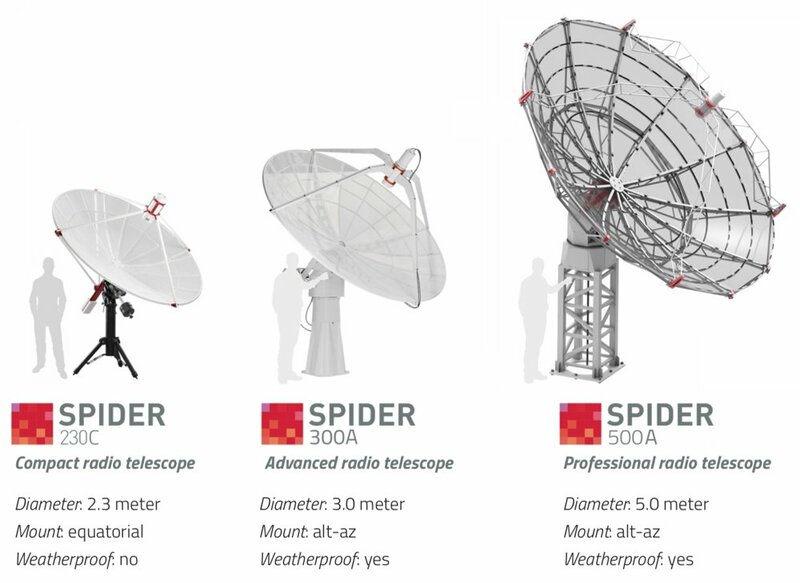 If you want to know more about our SPIDER radio telescopes, you can click here and discover all the available models. In order to allow everyone start his project, Radio2Space also offers design, shipment, installation and training services. Thanks to our team specialized in radio telescopes, we can support you from design to shipment, from installation to on-site training. If you want to know more about our services, please click here. The Sun is one of the strongest radio sources in the sky: if the part of the Sun emits more in the visible wavelengths is called photosphere, the radio frequencies born in the chromosphere and in the corona, the solar atmosphere. The solar surface has a temperature of about 6000K, and even if the gas at this temperature emits more wavelengths in the frequencies of visible and ultraviolet light, because of its proximity we can also record the radio emission. The Sun emits radio waves since it’s hot hot (it is said that it is a thermal source and then emits radio waves more at high frequencies) but there is a strong emission even at lower frequencies (in the field of non-thermal sources) for the mechanism of synchrotron radiation which derives from the movement of high speed electrons around the magnetic field. If we analyze the flux density (in simplified terms, the amount of radio waves arriving from the Sun) emitted as a function of frequency, we can highlight a second peculiarity: at wavelengths greater than 1 cm the curve is divided into two cases identified as “quiet Sun” and “disturbed Sun”. The first is defined from normal Sun activity while the second depends on the sunspots activity. In reference to “quiet Sun” emission , the solar disk has a different diameter in function of study frequency. At very low frequencies (below 0.1 GHz) and therefore at very long wavelengths (> 3m) the solar disk appears much bigger and brighter in the center, and its brightness gradually decreases and vanishes after several solar radii. For frequencies between 0.1 GHz and 3 GHz, the Sun is still larger than its optical counterpart and a radio peak intensity near the edge called limb brightening is noticeable. For frequencies above 3 GHz the Sun appears similar (though still greater in size) to its visible counterpart and its brightness is uniform. From these considerations it is possible to verify that higher frequency radio waves originate closer to the photosphere, the ones with lower frequency in the corona, which then gives the Sun a greater dimension in the sky. 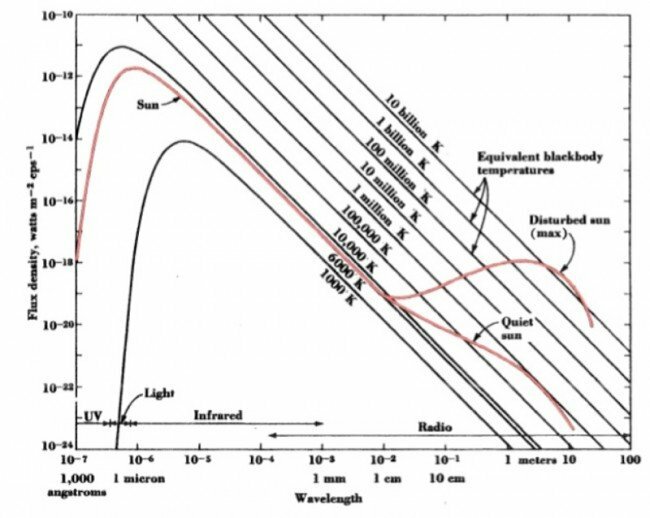 In the case of a ‘disturbed Sun’, it is possible to delineate a low variability component, ranging from days to months, which is evident at wavelengths from 3 to 60 cm and a high variability component characterized by strong emissions of radiation in time intervals from seconds to hours. The first component is closely associated with the presence of sunspots even when not directly visible because they are beyond the edge of the Sun. Then this radio emission originates in regions above the photosphere. The second component (with high variability) instead is linked to strong emissions that follow the occurrence of flares, violent matter explosions initially visible in the visible band of H-alpha (for example with specialized solar telescopes). Flares can be divided into impulsive or eruptive. The former have a short duration, from seconds to minutes, and develop only in the lower layer of the solar atmosphere. The latter have longer life, from minutes to hours, and can generate huge amounts of energy and matter ejected into space. Flares are caused when charged particles are suddenly accelerated. The energy required for this acceleration is derived from the magnetic field around the most active areas of the solar surface. During the impulsive phase of the flare, there is a fast increase in the intensity of radio waves with centimeter or decimetre wavelengths. The most powerful eruptive flares emit radiation for several hours. The characteristics of these types are well illustrated when considering the events that follow a solar flare. In phase 1, there is a strong type III emission immediately after the onset of a flare visible in the H-alpha line. There is a very strong radio emission that ends quickly and that, it is believed, is derived from the oscillations of the plasma associated with the expulsion of electron beams in response to flare. Sometimes, especially at frequencies below 100 MHz , the flare is associated with a more continuous and long lasting emission, the type V. The electromagnetic waves of this type are generated by the acceleration of electrons along the magnetic field lines in the corona. In events strongest , ie in the eruptive ones, there is also the phase 2 which begins with short and net signals peaks which often also include a second repeat (harmonic). This emission comes by the shock wave front to the gas cloud above the flare. At times, immediately after you can record a weaker but continuous signal that can last from hours to days and that is called type IV . The latter is related to the synchrotron emission coming from the gases above the flare and it can have short and strong signal peaks classified as type I. Among the radio burst type IV there is one type , called “mu-burst type IV” , in which the signal is emitted, with wavelengths from 30 cm to 1 cm, so even above 10 GHz. 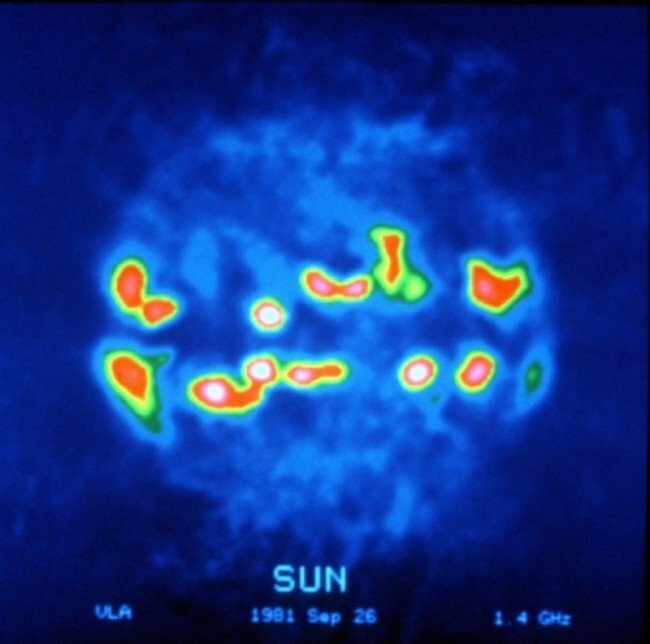 This allows us to understand that the Spider230 radio telescope can also be used for studies of thesesolar atmosphere phenomena, possibly associated with a H-alpha solar telescope to study simultaneously the different components of the electromagnetic spectrum coming from the same phenomenon, namely a flare. Sometimes, during the most intense phenomena, high energy cosmic particles are emitted from the Sun and, when they encounter the Earth’s magnetic field, they generate magnetic storms and auroras. Largest radio telescopes in the world are used by professional radio astronomers, and often you can also visit them. 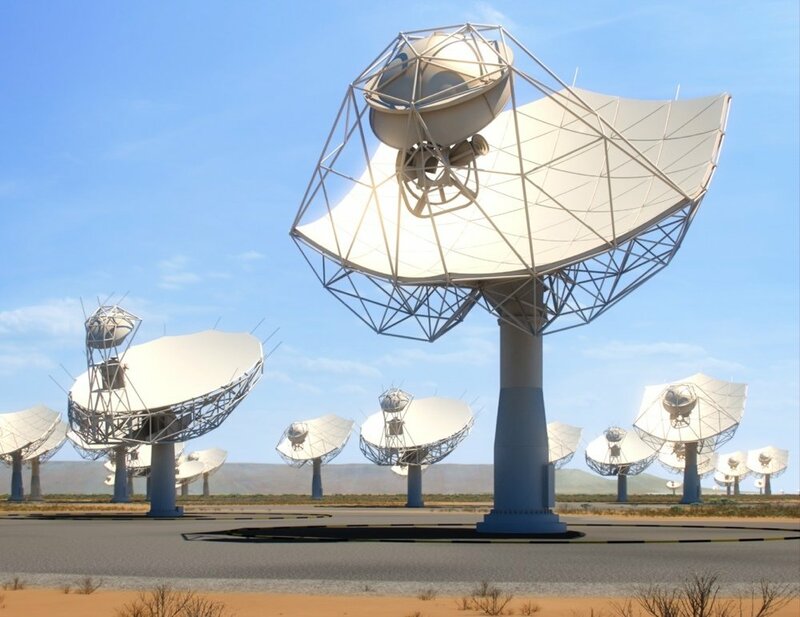 Radio telescopes are extraordinary instruments, equipped with giant parabolic antennas or other, designed to work as single instruments or as interferometers. They are used to study objects in the Universe in radio waves frequencies but often are also used for satellite communication or studies of Earth’s atmosphere. Here you have a list with some of the largest radio telescopes in the world and a brief description for each instrument. 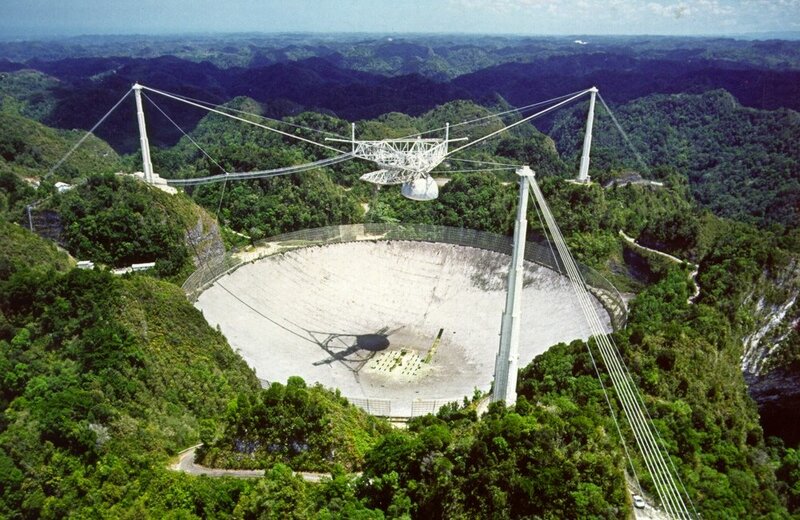 Probably one of the most famous radio telescopes in the world thanks to films like “Contact”, it uses 27 Cassegrain antennas each 25 meters diameter that can be moved along a Y shaped rail system. Up to 2016, it was the largest parabolic antenna in the world, thanks to its 305 meters diameter. The antenna was placed on a natural depression in the ground and it has no mount: the radio telescope can point different sky regions moving the central feedhorn. 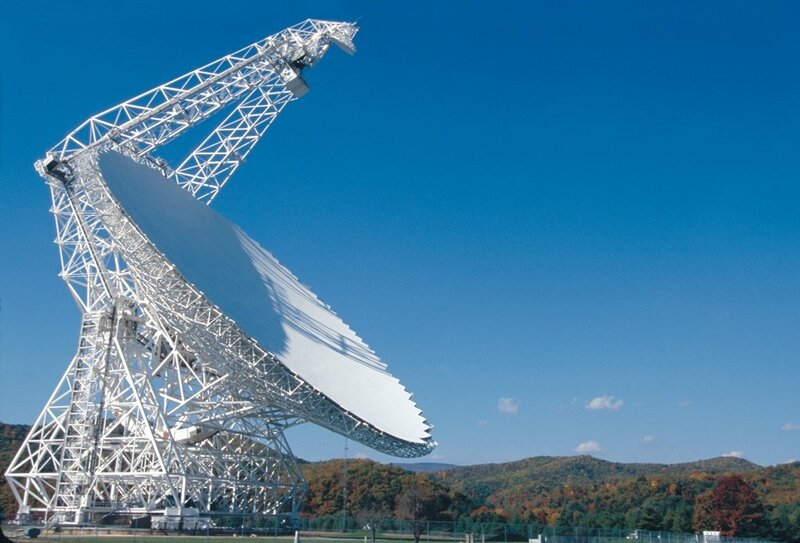 The Robert C. Byrd Green Bank radio telescope has a parabolic antenna with asymmetric surface and an off-axis illumination. 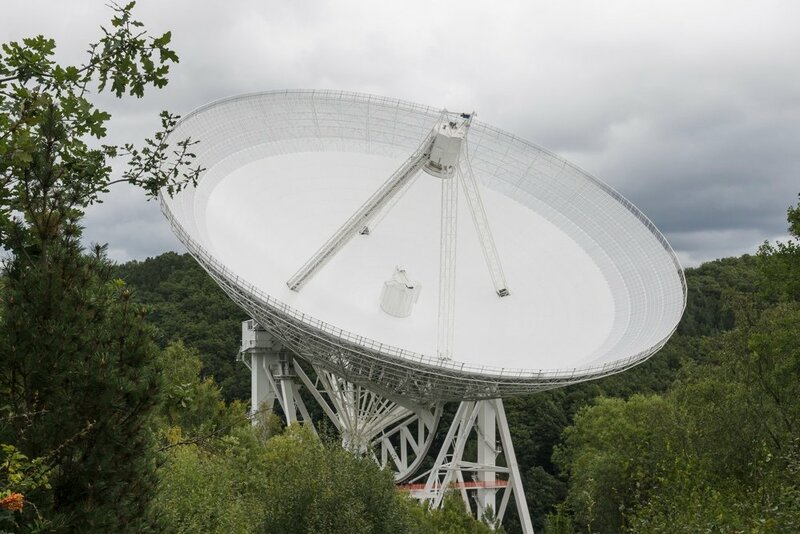 In Green Bank there are also other large radio telescopes such as the 43-meter diameter one with equatorial mount. 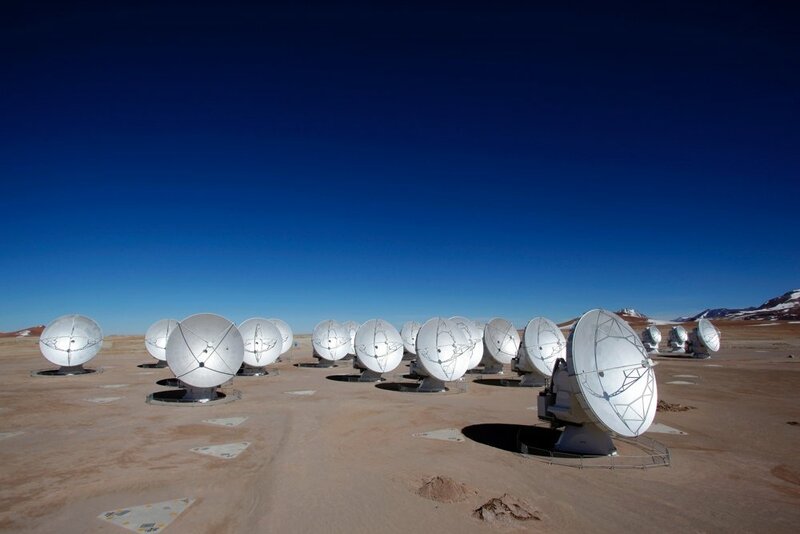 The ALMA radio telescope includes many 7 and 12 meters diameter parabolic antennas that have been installed in Atacama desert in Chile, about 5000 meters above sea level. Thus, it will study also the high radio frequencies usually blocked by the atmosphere. The Five-hundred-meter Aperture Spherical radio Telescope (FAST)) is a radio telescope located in southwest China. 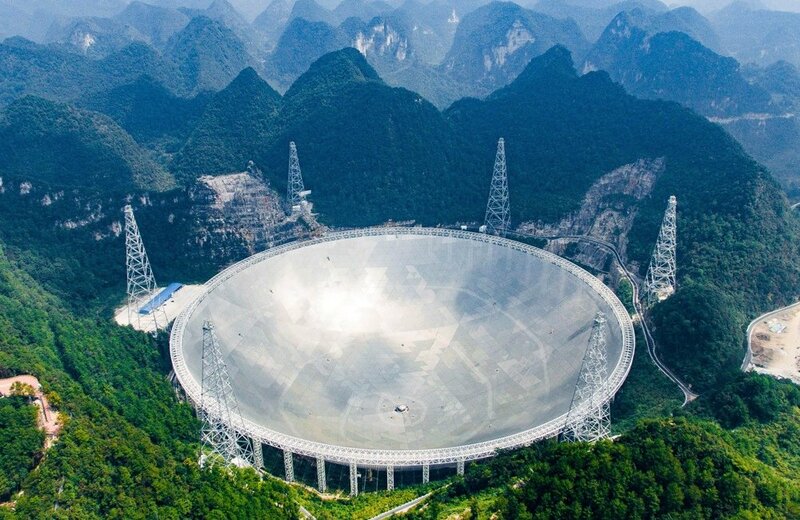 It consists of a fixed 500 m diameter dish constructed in a natural depression in the landscape and it is the world’s largest filled-aperture radio telescope. Thanks to the huge 100 meters diameter parabolic antenna, this is one of the largest radio telescopes in the world. This radio telescope weighs 3200 tons and it takes 12 minutes to make a complete 360 degrees rotation. Near Bologna there are two radio telescopes: the “Northern Cross” that consists of an array of antennas in two perpendicular arms and a 32 meters diameter parabolic antenna which is also used in interferometric observations. 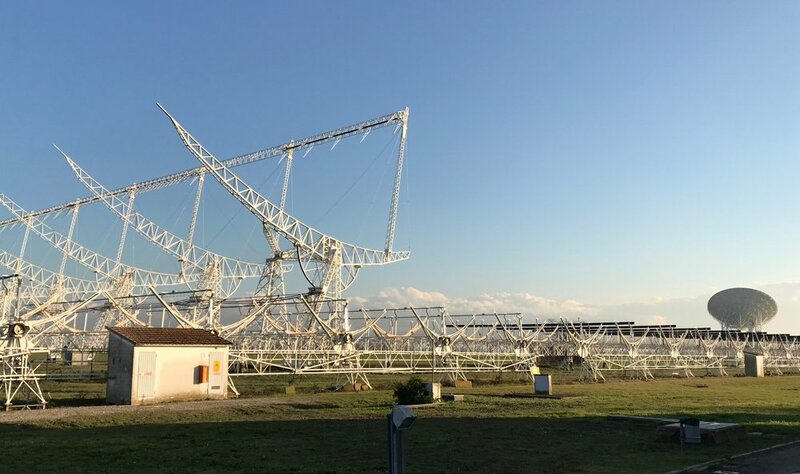 This radio telescope, built 35 kilometers away from Cagliari, uses a 64 meters diameter parabolic antenna designed with high accuracy (among the best of several radio telescopes in the world) in order to allow recording at high frequencies (up to 100 GHz). With its 76 meters diameter antenna, this instrument is one of the largest radio telescopes in the world with movable reflector. 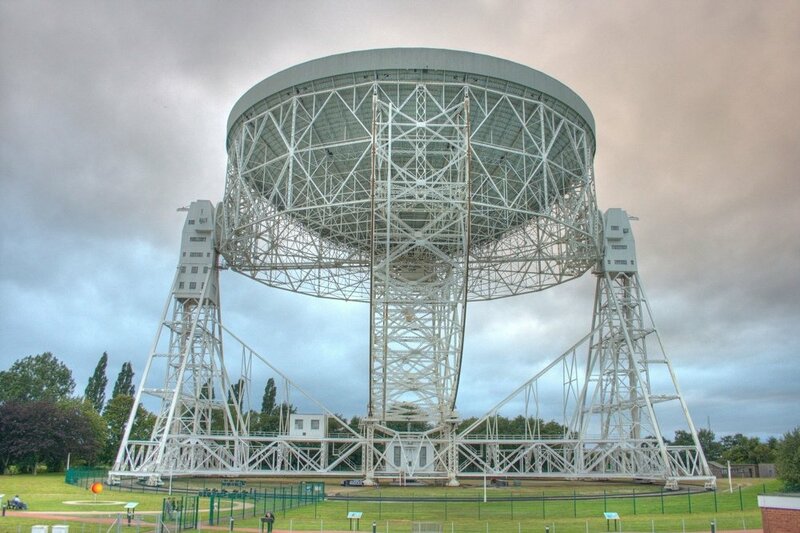 It is located in Jodrell Bank (England) and it’s part of English MERLIN interferometer system. 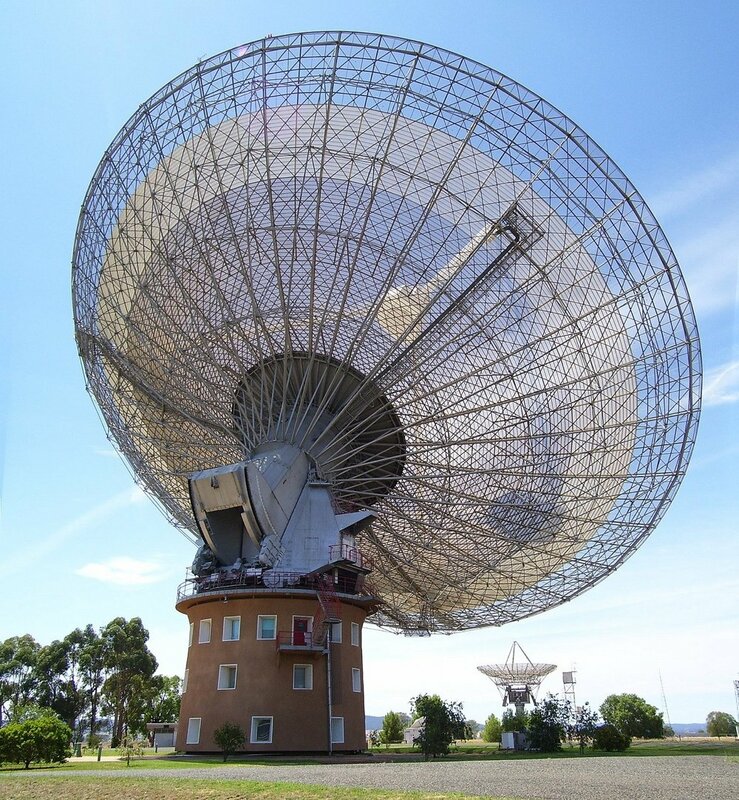 Parkes Observatory is located in the south-eastern Australia and it uses a great 64 meters diameter parabolic antenna. 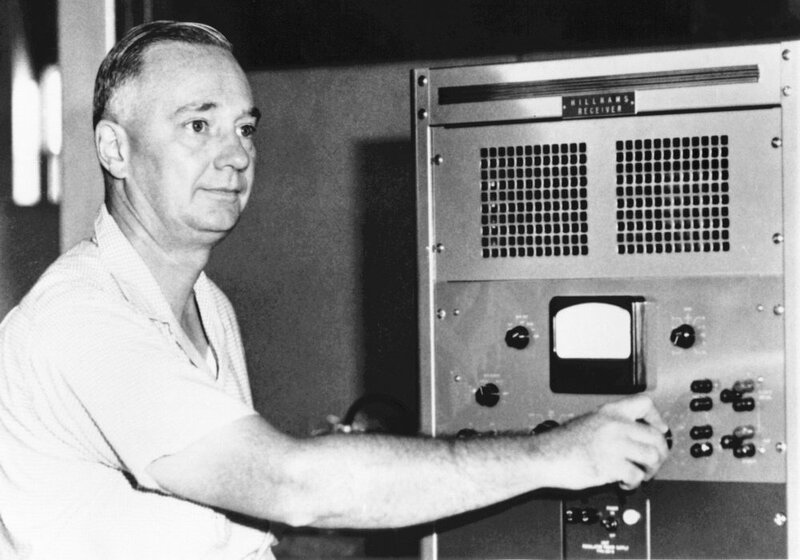 In addition to radio astronomy, it was also used to collect the Apollo 11 transmissions coming from the Moon. Currently under study, it uses a network of thousands of antennas installed both in Australia and in South Africa. Combining the recorded signals, it will be possible to obtain a collecting area equivalent to the one of 1 square kilometer parabolic antenna. Radio astronomy is a young science, born at the beginning of 20th century. There are two figures that have historically contributed to birth of this science: Karl Jansky and Grote Reber. Jansky was an engineer that, at the end of 20s, worked at Bell Labs in New York society where, in particular, he were dedicated to recording of atmospheric interference at shortwave. From summer of 1931, Jansky built an instrument and he began to record an inexplicable signal whose origin was not clear. 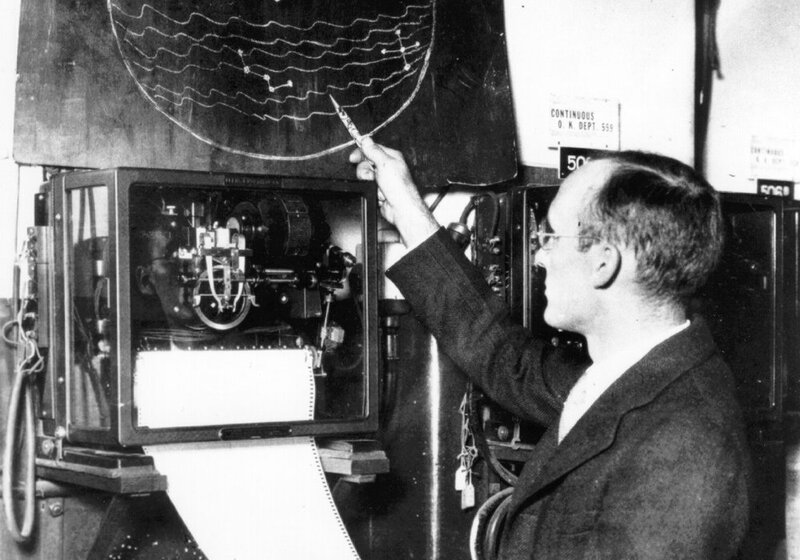 In 1932 he realized that the signal had every day a small advance over time and so Jansky concluded that it had to come from outside the Solar System. He became so famous in newspapers and on radio, but despite trying to attract attention of astronomers, his discovery was not followed. Jansky did not even have to any scientific recognition for his discovery and he died in 1950. Grote Reber was only to deepen Jansky results building an instrument in order to receive waves from space. He built it in his house garden, the first radio telescope with parabolic antenna in the world. His instrument was equipped with a parabolic dish with a diameter of 9.6 meters and an altazimuth mount. From 1937 he began reception attempts at 3300 MHz but got nowhere until, in 1939, he began to record signal coming from Milky Way lowering frequency at 160 MHz. He began to realize first maps of sky radio emission and, with the construction of new and more sensitive receiver at higher frequency, he gradually improved resolution capacity. After these initial and fantastic discoveries, few were interested in radio astronomy until the end of Second World War during which immense development of radar techniques allowed for the first time to build sensitive instruments to record faint radio signals also from more distant objects in the Universe. Radio waves: are characterized by higher wavelengths, greater than 1 millimeter. Higher frequency radio waves are called microwaves. Infrared: with a wavelength between 700nm and 1mm, we humans we can not see it but we perceive it as heat on skin. 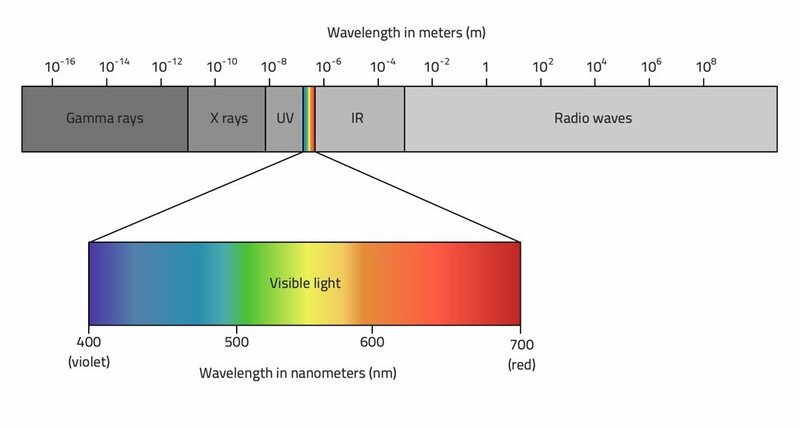 Visible light: with a wavelength between 700 and 400 nm, it is the part of electromagnetic spectrum that we can see and which is expressed through rainbow colors. Ultraviolet: it has a wavelength between 400 to 10 nm and it is responsible for our tans. X rays: characterized by a wavelength between 10 and 0.01 nm, they are very important for medical application because they are used for medical diagnostics. Gamma rays: with a wavelength less than 0.01 nm, are those with greater energy. Does this mean that if we want to study the Universe in ultraviolet it is enough to build a telescope for these wavelengths, have with a camera sensitive to ultraviolet and point it toward the heaven? No, because atmosphere of our Earth acts as a filter blocking large part of electromagnetic spectrum except the visible and radio one. That’s why you can use radio telescopes from the ground to study while for other frequencies it is necessary to construct and send special telescopes in space as satellites. In electromagnetic spectrum, radio window is extended from about 15 MHz (wavelength of about 20 meters) to 30 GHz (wavelength of about 1 cm). These limits are not clearly defined as they vary with altitude, geographic location and time.